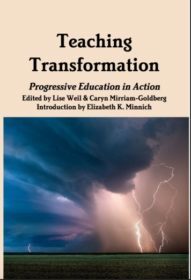 Teaching Transformation: Progressive Education in Action is edited by Lise Weil and Caryn Mirriam-Goldberg with an introduction by Elizabeth K. Minnich. This book, published by the Goddard Graduate Institute (GGI), is a collaborative project between GGI faculty, students, and alumni. We are grateful to Goddard College’s Fund for Experiments and New Initiatives for supporting this project. Buy a signed copy from Caryn. Or for your free download, please click here. Also available at Lulu.com through this link and Amazon here. Teaching Transformation: Progressive Education in Action shares vibrant stories of how students in the Goddard Graduate Institute's Individualized MA, Social Innovation and Sustainability, and Health Arts and Sciences programs find and enact their vision, make and keep community, and foster enduring social change and ecological stewardship. "Goddard changed my life" is a popular phrase at graduations. Teaching Transformation is a gold mine of ideas written by those on the front-lines of progressive educational about ethical, moral and political nature of education; the culture conditioning on learning; the need for "seeing the world through new eyes"; and developing capacities of awareness, receptivity, deep listening, and response. ~ Richard Schramm, former faculty at Goddard, Columbia, Cornell, Tufts, and MIT.